Live on Periscope, Facebook, & Instagram. WELCOME to the Free Lessons page! In 2016, I started live streaming video lessons and discovered an incredible opportunity to serve the online music community. Within the first 10 lessons, it became apparent these video streams were a catalyst for inspiring questions and conversations with other people also passionate about music teaching and learning. Begin process of streaming on multiple platforms including Periscope, Facebook, & Instagram. As we wrap Season 3, I’d like to say thank you to everyone that has participated and let me know they’ve found the material helpful. Your comments, shares, and direct messages are sincerely appreciated. I can’t wait to continue working on more creative projects and connecting with you soon! Live streams and replays on Periscope, Facebook, & Instagram. Tweet you’re watching & watch on your favorite social media platform. Thanks for sharing and inviting with your friends! 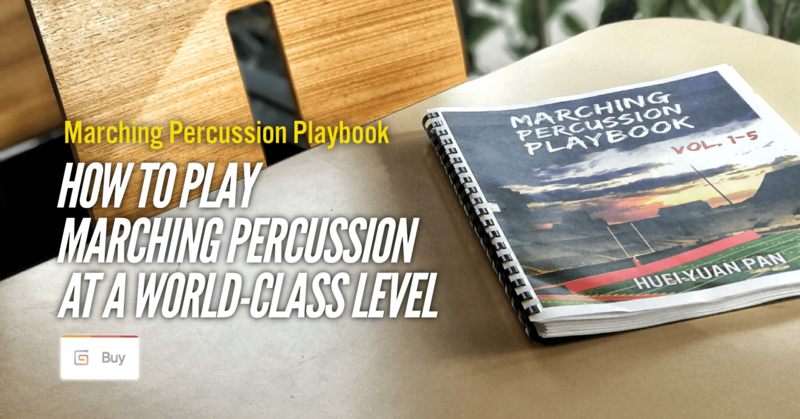 The Marching Percussion Playbook has helped hundreds succeed online. It can help you too. The first step is to just start – so start today! I really love these handouts, especially since I’ll be the center snare next year. I’m trying to take in as much information as I can so I’m ready to take on the responsibility of leading the section and sharing all my knowledge with my peers. HUEI, YOU’RE THE MAN. THANK YOU. If it weren’t for you and your handouts, your many videos and teachings, I would not be where I am today. I’m marching with one of the best collegiate drumlines in the nation and just received a contract for the world class independent ensemble, Equinox Percussion. Thank you for everything that you’ve done for me and for the percussive community. By keeping up with Huei’s periscope lessons and soaking in his ideas and teaching tools, I have become a better instructor and, as a result, a better player. Because of you, I have learned a variety of different ways to approach topics in percussion which enhances my ability to understand as well as teach others. The informational text is very straightforward and easy to understand. This benefits the “non-percussion” percussion instructor in their quest to possibly teach younger students or start a drumline of their own. I just want to thank you, Huei! I have been using the handouts and watching the video lessons and they have really helped me develop as a player. Because I watched the video lessons and used the handouts I was able to make a independent winterline for the first time. I can’t wait to keep using the handouts and streams to grow even more as a player! Thanks again, Huei! Over 7,000 PDF’s have been downloaded since the star of Season 1! If you downloaded and used any of the free handouts, please consider leaving a testimonial – I’d appreciate it!